Born into a middle-class Polish Jewish family, Szyk lived a life framed by two world wars and the rise of totalitarianism in Europe. A refugee, he ultimately settled in the United States in 1940. Much of his work centered on these experiences. As a miniature artist and political caricaturist, he used motifs drawn from the Bible, history, politics, and culture to pair extraordinary craftsmanship with searing commentary on a diverse range of subjects including Judaism, the American War of Independence, the Second World War, the Holocaust, and the founding of the State of Israel. The hundreds of artworks, sketches, and painstakingly assembled illustrated books, journals, archival documents, photographs, exhibition catalogs, and memorabilia that comprise this multi-faceted collection are in the process of being examined and catalogued so that they can be made available for research, exhibition, loan, and publication. 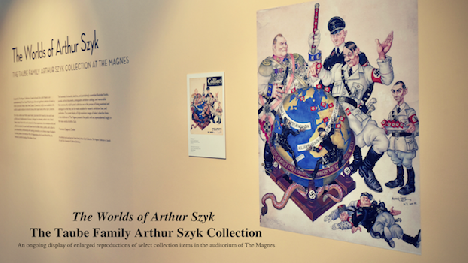 The current display of high-resolution images of select collection items in the Auditorium of The Magnes presents the public with an unprecedented insight in the many worlds of Arthur Szyk.